Living in Spain as an American has made me come to realize many things, but I’d like to address one in particular. The Spanish know how to party. I am personally insulted by the dinky, unimpressive, poor, feeble attempt of a celebration we Americans try to make for the Fourth of July every year. 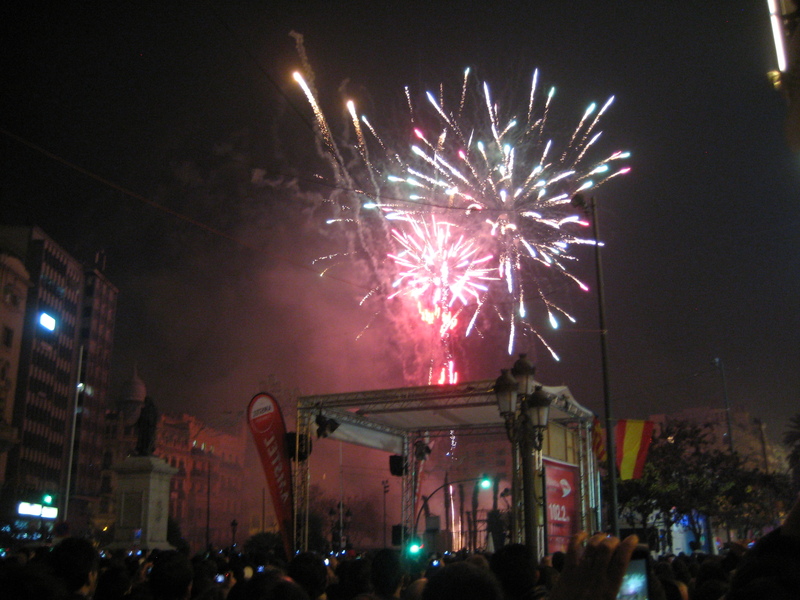 You would think our Independence Day celebration would be of enormous revelry but it is a dry, short, and disappointing display in comparison to Valencia’s fallas. At the Fallas, people throw petardos (firecrackers) and cohetes (rockets) at all hours of the day. Not just during some meek and miserable show of ten minutes of fireworks at 9 at night, but at all hours of the day, from dawn to dusk. And then some. We prepared for the biggest party of our lives by partying the night before. Friday night out till 3 am, up Saturday morning by 7, on the bus by 9, in Valencia by 1. Our preparation: packing hang-overs, hunger, and exhaustion. This pattern seemed to never stop. When we arrived, it sounded like we landed right in the middle of war. There was smoke billowing out from every alleyway and street and the cacophony of crashing and booming explosions from hundreds of fireworks going off made us want to run for cover. We had to walk the streets cautiously, as if we were being hunted by snipers lurking in the buildings high above us. People were tossing fireworks recklessly and carelessly all over the place. Even children were throwing firecrackers at each other. If you weren’t careful, you’d get a firecracker in the foot, bursting like a land mine. Valencia was truly stunning: Palm trees, clear blue skies, and perfect sit-on-a-terrace-and-have-a-beer weather. We all had plans of visiting the beach and seeing the Oceanografic (Europe’s largest aquarium) but after having been there for no more than fifteen minutes, we realized that we weren’t going to do anything other than party, after the first beers were cracked open. The rest of the night continued how it started that afternoon: wandering, admiring the brightly colored traditional dresses of the local women, drinking beer and tinto de verano, watching fallas burn and chatting with whoever we met. 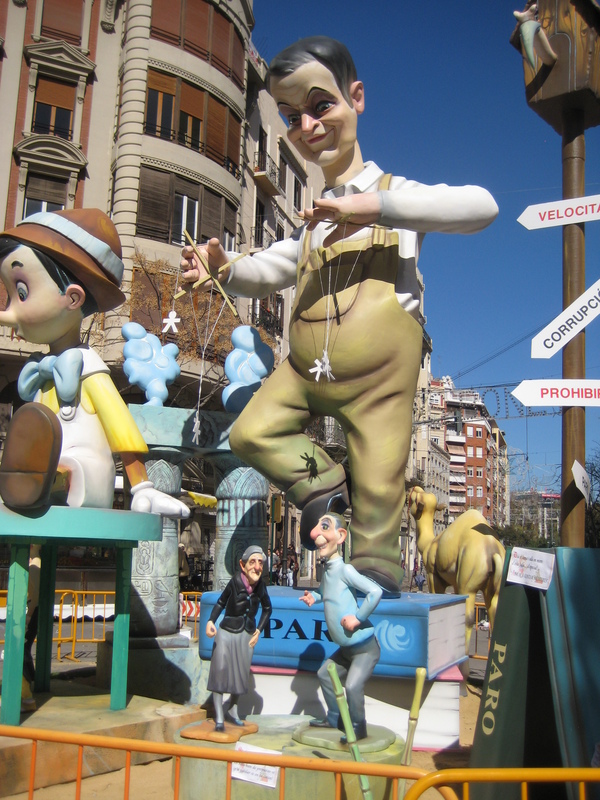 The fallas (large papier-mâché sculptures of political figures, cartoon characters, etc.) weren’t burnt down until about 11 that night, and the grand finale was at 1 in the morning the next day. The finale was incredible as the largest falla was set to light, erupting in a volcano-like tornado, burning right in the middle of the city surrounded by thousands of on-watchers. As if the vortex of smoke and fire wasn’t enough, rockets were then launched into the cloud creating a cyclone of brilliant lights and riotous bursts. It was mesmerizing and beautiful, and at the same time, deafening from the cheers of the crowd and the ceaseless barrage of discharging fireworks. After what seemed like a lifetime of non-stop movimiento, the moment arrived to head back to the bus. We finally made it, mission complete. Seven in the morning, heading home. We had survived. But at this point we were defeated, exhausted, drained, and all we wanted to do was sleep. We rode the four dreadful hours back to Madrid where we were finally able to crash. I cannot say how many hours I slept after that trip, but I’m sure it was something close to a world record. I hope to be able to go back to Valencia to actually see the city but one thing is for sure: I’ll be returning for next year’s festivities. Only this time, I’m going to bring sandwiches, water bottles, and a pillow.